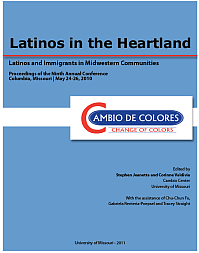 Cambio de Colores / Change of Colors - Latinos in the Heartland - Tenth Annual Conference - Kansas City, MO. This is an archival site for the tenth Cambio de colores conference (2011). THANKS TO ALL THAT ATTENDED AND PRESENTED! Grupo Folklórico Atotonilco, Kansas City, MO comes back to Cambio de Colores! Founded in Kansas City's Westside by Maria Chaurand in 1979, Grupo Atotonilco is a very well known Mexican dance group that comes back to Cambio de Colores. They showed their beautiful trade at the first two conferences in 2002 and 2003. They will be performing this Wednesday June 8th at 7:30 PM, during dinner. June 1st: One week to go! Check the always up-to-date Conference Program. April 25th: The Conference Program is now set. Over 45 presentations and workshops coming from across the nation. Conference Posters available for download: Poster 17x11 / Flyer 11x8 (PDF files). Registration is Open! Take advantage of the Early Bird rate, and make your hotel reservation at a special rate. Wednesday June 1st: Late registration fee of $25. Registration at regular rates available through the end of May. Monday May 2nd: Deadline for papers for the conference's book of proceedings. Monday May 9th: Last day to take advantage of the Early Bird registration discounted rate. Copyright © 2010-2011 – Curators of the University of Missouri. All rights reserved. DMCA and other copyright information.